My assigned day was the second day! This is what I imagine when I think of a turtle dove. Otherwise, if you google an actual turtledove its a pretty plain little bird. Nothing against the turtledove, I just like my reptilian flying creature idea! This entry was posted on December 14, 2010 at 11:08 pm and is filed under characters, Illustration, Projects, Twelve Days of Christmas. You can follow any responses to this entry through the RSS 2.0 feed. You can leave a response, or trackback from your own site. Hee hee!!! I love those little guys. I often have the same picture in my head… although your rendition is way cuter! Same here. As a child, I was always confused… I love your version. yep…. you captured exactly what see in my head every time I hear that song! Cute Candace! Very clever and well executed. 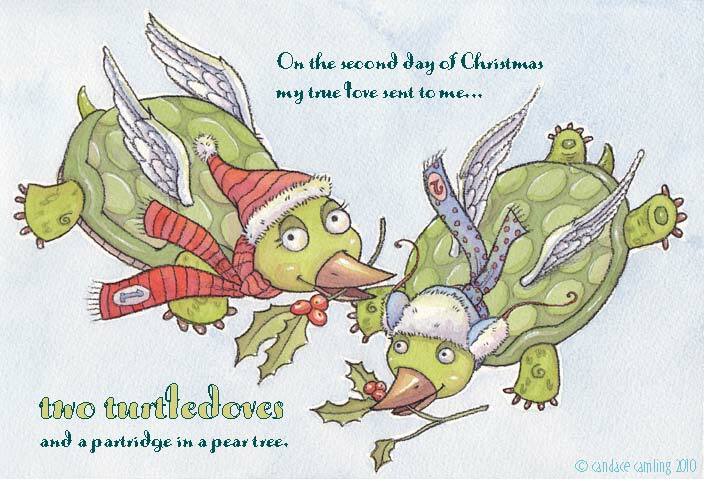 I will never think about turtledoves in the same way. Their little wings must need to flap super fast to lift their little turtle bums of the ground. This is so great! Very creative! Love their little scarves, hats, wings. So cute!